2016 is here and we are already excited for the upcoming season! We will be sending out our annual property care proposals starting in a few short weeks! Please take a moment to go over your plant health and lawn care recommendations. 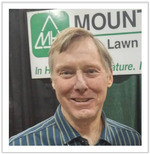 Many of you will see lawn fertilization recommendations for your property this year. Technological breakthroughs on our "Extended Release" fertilization program have made this our favorite program. 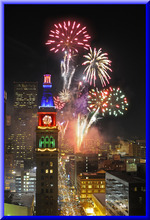 From all our staff and crews at Mountain High Tree, we wish you a very happy and prosperous New Year! Thank you for your continued patronage – cheers to a great year! With the recent snow and cold weather most of us have to use some type of product to help keep the resulting ice under control. There are many products on the market that can be used and each has different properties, end results and impact on your landscape. These products can be very effective if used correctly. But if they are overused or misapplied, they can damage the concrete as well as nearby plant material, including the lawn. All of these products are acceptable for use. Limited use of any of these products should cause little damage. Problems occur when they are used excessively and there is not adequate rainfall/moisture to wash or leach the material from the area. It is still best to remove the snow and ice by hand when possible and spot treat with the ice melts, thereby using lesser amounts. Putting these products on newly poured cement is also not recommended for the first year. If damage from de-icers is going to occur, it will not be noticeable right away. Problems are uncovered in the spring when the plants and grass along the walks are dead. ​your plant health in the spring. For more articles click here. Once again the rabbit population along the Front Range is extremely high. Several factors, including the decrease in foxes and other natural predators, coupled with the extra precipitation of the spring, have contributed to this.When food sources are abundant the populations of rabbits per litter goes up. On average, rabbits have between 2 and 6 litters per year, each with up to 6 babies (the proper term for a baby rabbit is a kit, multiple babies are therefore called kittens). Over this past year the numbers of litters and kittens per litter have been toward the higher end of that range. 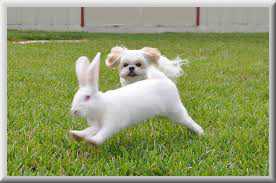 Rabbits can do a great deal of damage to lawns. With high populations and the inability of grass to grow during the winter, they can cause serious problems for the lawn in spring. 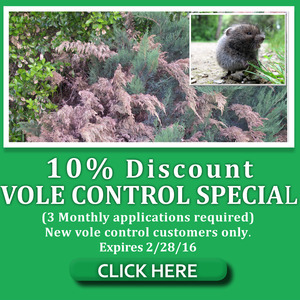 These damaging rodents normally spend their entire life in an area of less than ten acres, so once they become established in a lawn, they are unlikely to move without a good reason.The damage they can create can lead to big problems for yards and even shrubs. They not only chew grass down to the root, but the concentration of urine frequently creates brown and dying areas, making it harder for the grass to recover. 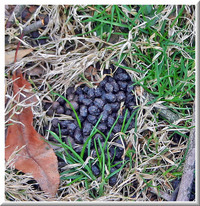 When grass is dormant in winter, there is no chance for a recovery – meaning the rabbits’ feeding and excretions can kill areas of the lawn. Once this damage starts it tends to progress because rabbits like to feed in the same areas, and will even lead their kittens through their scent to those same areas. If areas of the lawn are showing damage, the best thing to do is to make the rabbits not want to come back. Then, once they are off the property, fencing off the area can keep them out. If damage can be stopped early before urine or stress kills the entire area, it can be reversed. Rabbits don’t eat the root system. This means the lawn has a great chance of coming back. Although difficult, it’s not impossible to get rid of established rabbit families. They love low-to-the-ground shrubs as well as taller grass, because it provides them with shelter and extra food. Eliminate areas they could hide. Trimming shrubs and bushes, putting chicken wire below porches so they can’t get under areas where they can build dens, and elevating any kind of decorative garden pieces where they could hide are all good countermeasures. Another way to get the annoying rodents to seek a new location is to cut off their food supply. Put perimeter fences around, making sure that the openings of the fence are smaller than a rabbit’s head and dug 6 inches into the ground so they can’t sneak through underneath. Spraying/sprinkling different natural odors on your plants like capsaicin (pepper extract), castor oil, ammonium salts, or predator urine can also help, but they must be reapplied after every watering or rain. Another good option is to let household pets out onto the lawn areas in the early mornings and late evenings when the rabbits are most active. 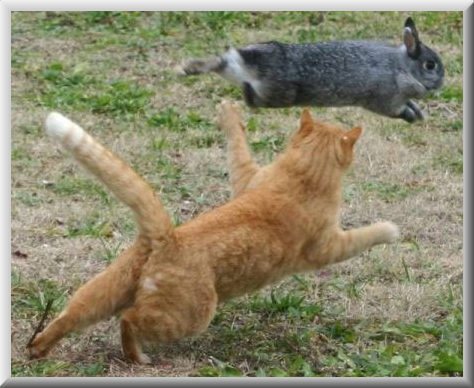 If rabbits are constantly getting chased by something they deem as a predator, they will be much less likely to stay in the area and it will discourage them from breeding in those areas. 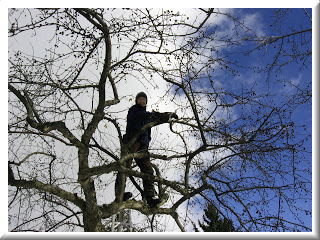 Winter is one of the best times to prune young deciduous trees. Since the leaves have fallen, you can easily see the tree’s structure. Removing broken, dead, rubbing and diseased branches now, will help to promote good branch structure and a healthy tree. 1. The trees look great. 2. Timely and courteous. 3. Clean up is good. Thanks! Ace crew that did an incredible job! Always tiday at the end of the job! You have very good people. bushes that we are saving. Prompt arrival and professional removal fast! worked with were quite professional. amazing job and the crews are great. Mountain High is THE BEST! They were friendly, fast and efficient! In Colorado a major obstacle for trees is harsh winter storms that can bring dry Chinook winds with heavy, wet snows or “hurricane” force winds that damage tree structure. Besides getting a good look at the structure and form of a tree in winter there are other benefits of winter pruning. When other plants in your yard are dormant it is an opportune time to prune your large trees and minimize impacts to the rest of your landscape. Prune fruit trees and susceptible Hawthorns in winter to avoid disease activity,and trees such as American Elms or Pines when bark beetles and other insects are dormant. 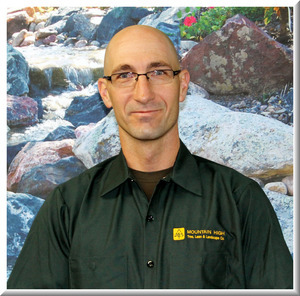 Contact us today at 719.444.8800 or online below to request a free estimate. in the Northeast and then here in the West. large Cottonwood or using a crane to remove a hazardous tree, being a Certified Arborist at Mountain High is one of the great joys in my life. To read more about Craig click here.